Osco offers the widest selection of hot runner interface options to meet the needs of our customers. Each and every option comes with the thoughtful Engineering and quality craftsmanship which has been Osco’s hallmark since 1982. Adding value to our customers program is Osco’s primary goal. Each of these interface options meet that goal with a fair and reasonable price, and on time delivery, too. 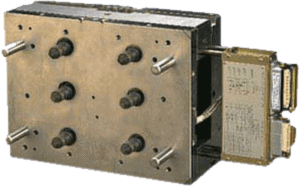 QSS Quick Set System – “Out of the box & into the mold” type of interface. Furnishes the Osco System mounted on a system mounting plate. All of the installation benefits of the HH but at a lower price. Pre – Wired Systems – Furnishes the Osco Manifold fully wired, and includes the wiring diagram for nozzle connection by the customer. Manifold and Components – This option supplies only the Osco System. The customer will handle all machining, installation, & wiring of the hot runner system.